Since the time of Hippocrates, diet has been widely acknowledged as a cornerstone of health and wellness. There is little doubt that eating natural foods, reducing sugar and avoiding snacks plays a huge role in weight control and metabolic health. But this is not the only dietary aspect of healthy aging. Longevity is not only about living a long life. Nobody want to live with chronic illness and pain. 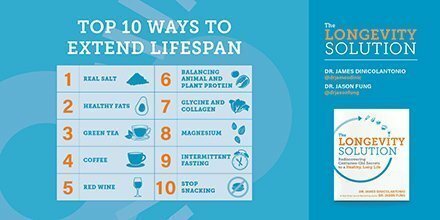 Longevity is not just about increasing lifespan, but instead about increasing ‘health-span’. It’s more about quality of life, not total length. It’s a fascinating topic, so I’ve teamed up with Dr. James DiNicolantonio to bring you a new book, The Longevity Solution, now available for pre-order on Amazon. In this book, I cover the role of fasting and longevity, but there’s far more to the book than that. We discuss the scientific theories behind aging. While chronologic age is a river, moving only in a single direction, aging, in physiologic years is not. Some people age more gracefully than others and it is these ‘best practices’ that are the focus of this book. We discuss theories of aging, and the paradigm that dominates this book is the competing demands of growth versus aging. Our growth ‘program’ dominates during our early years up until early adulthood. Then, our body stops growing. We reach our adult height and we don’t grow any more. Growth factors play a huge role in this. And the nutrient sensors insulin, mTOR and AMPK are also intimately linked to growth. But after adulthood, growth is fundamentally at odds with longevity. Just like a car engine, if you rev it too many times, it will go faster, but will also burn out quicker. So the very same ‘program’ that is optimal during youth is not conducive to graceful aging. If we want to slow growth, then we want to reduce nutrient signalling, too. Insulin and mTOR, key nutrient sensors also promote growth. By reducing carbohydrates, we can lower insulin and promote longevity. However, there is the tricky question of optimal protein intake. Too little protein is obviously bad, since our bodies depend on getting enough to maintain function. But the most controversial question is whether too much protein is bad. This is a difficult question, and one that requires a nuanced approach. Until recent years, it was practically considered impossible to eat too much protein. Low carbohydrate diets like the Atkins diet recommended low carbohydrate intakes, but made no specific recommendations about protein or fat. When combined with the low fat mania, we saw some people eating a low carbohydrate, low fat diet – which leave only protein in the diet. This turned out to be very difficult to follow. It was highly restrictive and was basically egg whites, salad and turkey all day long. The big differentiation of the older style low carb diets and the popular Ketogenic or keto diets is that Keto diets allow liberal amounts of fat, and suggest moderation of dietary protein. Eating too much protein often kept one out of ketosis if you were eating constantly. Remember, during this time, there was the strong belief that we should be eating 6-10 times per day, promoted by many physicians based on no evidence whatsoever. Eating a diet much, much higher in fat allowed ketosis and for some people, it was highly successful. There are many other nuances in protein intake, too. There is a big difference in animal versus plant proteins. Generally, since we are animals, those proteins are closer to what we need, and have a much higher biologic value. Animal proteins are far more nutritious, and the reason why traditional societies spent so much effort on hunting animals, even though for most, their main source of food was plants. This higher nutritive value is great if malnutrition is the problem. Unfortunately, overnutrition tends to be more of a problem in today’s world. Therefore, the high nutritive value is not always beneficial. Protein, specifically amino acids are the most powerful stimulant to mTOR, the nutrient sensor known as mechanistic target of rapamycin. This pro-growth signal has been linked to many diseases of aging and excessive protein. If you are interested in a more in -depth discussion of this difficult question of optimal protein intake, pick up a copy of The Longevity Solution. Already preordered it and can’t wait!! Will this book be available in an e-book format? Already ordered- can’t wait as it will supplement my MOOC on ‘Molecular Aging’ from Groningen University. I’m not so sure about restricting carbohydrates, all blue zone diets without exception have high carbohydrate percentages compared with protein and fats. The difference may be they are from “healthy sources” not junk food.